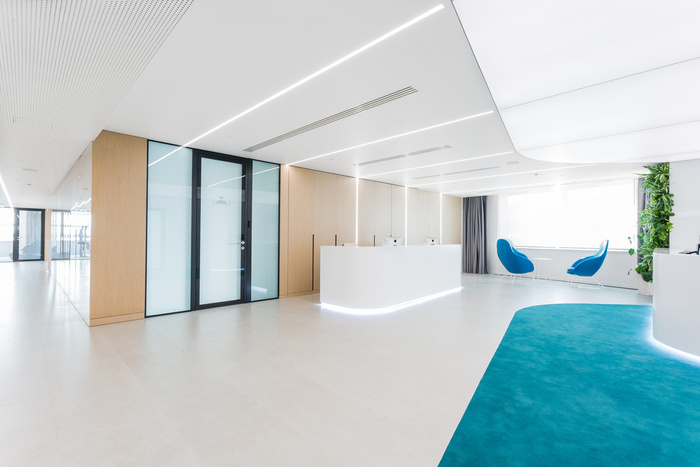 IND architects was engaged by Sibur, Russia’s largest integrated gas processing and petrochemicals company, to design their offices located in Moscow, Russia. Creating the new office for Sibur, we sought to transform not only interiors, but also to contribute to transformation of the work organization, to help to improve and simplify working interactions between the company staff, to make those most comfortable and effective. All these by design and architecture methods. The new modern office provides high mobility of space, existence of zones for informal communication, a huge number of places for meetings and negotiations including in places, not intended for this traditionally – for example, in a corridor. By March, 2018 finishing of the office two floors is completed — on first one the open-space for employees who are engaged in the central management of holding is located, on another — the company administration. The new design has completely changed the office structure, having transformed cabinet system to the open-space. Since the office location has complex planning structure, here not the only one big open-space is built, but few of those. Besides working space and zones for informal communication, rooms for individual work, wardrobe rooms and zones for storage are presented here. In the office there are the conference room and coffee points, and also phone booths where it’s possible to hold important phone negotiations in the quiet atmosphere disposing to the maximum concentration. The office has united possibilities for fast generation of ideas, including in the working group, and a possibility or privacy during accurate study of these ideas. For this reason in the office there are a lot of places for fast meetings and negotiations. However, the furniture for them is thought over very carefully – for example, these are sofas with a high back which have also the sound-proofing function. In the offices of the company executives the smart office system is installed which includes among other things light sensors, climate control system, multimedia control and conditioning. Control over these functions can be carried out via the central touch-panel located at the desktop in each office. Special sensors measure the level of illumination and automatically make the lighting brighter or dimmer. This solution is comfortable for work, financially favorable and also eco-friendly, for example, in late spring, in summer and in early fall, that is the most daylight of year, lighting can work not at full capacity, but only at 10-20%. Also each office is equipped with video walls. The system for organization of videoconferences is performed in full HD format which offers high quality of the image and sound, and makes negotiations in video format most comfortable and productive, for example, just like at the live meeting, interlocutors will be able to see facial expressions and hear intonations of each other. Meeting rooms are protected from the outside sounds, smart glasses allow to make windows opaque with one simple touch. Interior design reflects innovation of the company, its care of the ecological environment and is based on the corporate style. Complex lighting solutions, interactive information walls create the atmosphere of the innovative company. The built-in lamps in open-space zones have square lens for maximum efficiency and dazzling protection, creating a comfortable directional light. In the common zones lamps with diffused light are used for creation of softer natural lighting. In the executives’ offices lamps with the maximum coefficient of color transfer are used, the light source is drowned, creating the dark light effect. Well-designed phyto-solutions: soaring cachepots, green walls form the image of the eco-friendly space. Color accents are created on the basis of Sibur corporate style. Against the neutral monochrome background rich turquoise elements are brightly allocated, generally these are floor covering, furniture, some interior decoration items.